Do you need to purchase equipment for your medical practice? I bet you're not planning to pay cash, right? MRI machines, lasers, physical therapy equipment, -totally not cheap. Most of the time, you'll end up financing or leasing your equipment. There isn't a lot of information publicly available about medical equipment financing rates. It is even more difficult to find the "real" cost online for something like medical equipment leasing... for example, what the rates would be with bad credit. This article will attempt to help you get some real answers. The good news- there are a lot of options available to finance medical equipment. Let's go through all of these and talk about the costs of each one of these options. 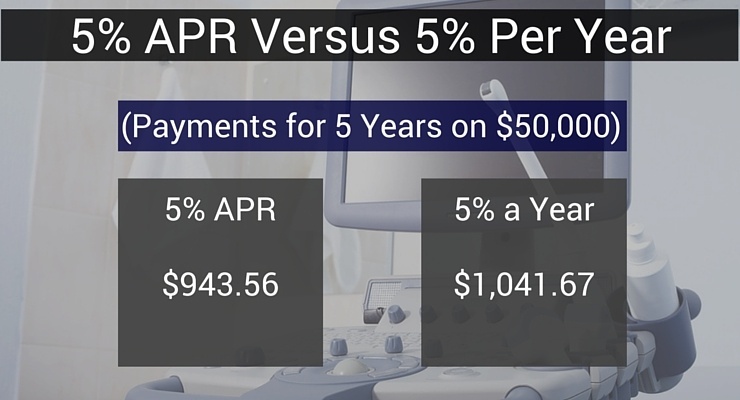 What are Medical Equipment Loan Rates Through a Dealer? When you buy medical equipment from a dealer, you may be offered cheap financing. It depends... but sometimes you can score zero percent. Some companies make enough money selling you equipment and use the financing as a sales tool to sweeten the deal. In order to qualify for this cut-rate financing, you should have very good credit and not be a newer practice. Dealer rates are over the board. In general though, if they will finance you for a 5% or lower rate, that's a deal you should take. One thing to watch out for: if the dealer isn't advertising their rates - but they offer financing - it's more likely the financing is a profit center for them. Since many customers won't bother to shop, the rates could actually be higher than what you would pay elsewhere. This isn't always the case, so before just signing up with the dealer for financing it's a good idea to call a few medical equipment financing companies to see if you can get a lower payment elsewhere. What are Rates to Finance Medical Equipment With a Bank? If your dealer doesn't offer rock bottom interest rates (or doesn't offer financing) your next stop may be to your bank. Bank financing is good deal if you can get it. Rates often range from 6% to 12%. Remember, though, bank financing for equipment is very difficult to obtain. Since the rates are low, if more than just a tiny sliver of borrowers default the bank goes upside-down pretty quickly - there is no wiggle room for error. When you borrow from the bank, you will be looked at with a microscope and if the bank can find any reason whatsoever to deny your application, they will. You should have great personal credit (a 720 score at the minimum), time in business (at least 2 years) and ample revenues- it depends on the bank, but often at least $1 million a year. The other challenge with bank financing is that scrutinizing your business takes time, expect the process of telling you "yes" or "no" to take a month or more. With that being said, if you've got the time to wait for an answer and your business numbers support that you'd be "bankable" bank financing might be a viable option. What are the Rates for a Medical Equipment Loan? ...your next step is to look into medical equipment loans or leasing. As far as the rates - there's a huge range. You may notice that most websites that mention rates mention only the lowest possible rate. They'll mention what established practices would expect to pay - assuming perfect credit. You might also see some advertisments talking about "5% rates." In almost all cases, that is not referring to an "APR" like at your bank. That means 5% per year. 5% a year is the usual starting point to lease medical equipment. 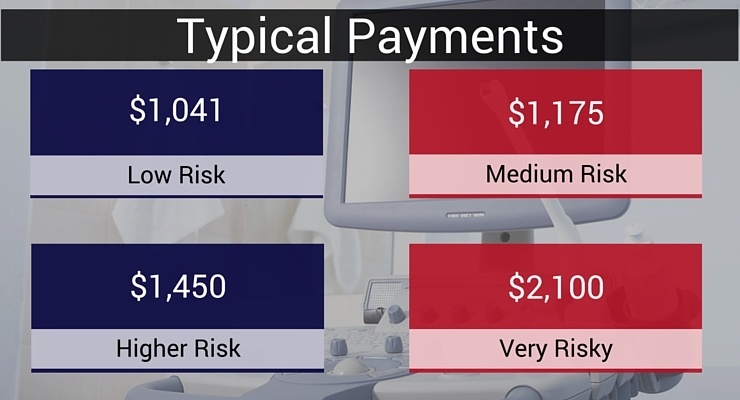 However, if your practice is new, or your credit is pretty bad, payments could end up being higher. Do Rates Matter When You Lease Medical Equipment? Many equipment finance people dodge the question or lie when they are forced to tell you the interest rates. That's because if your credit is bad the rates can seem high, and they are afraid of losing their "deal." Basically, get the lowest rates you can, but don't let a high payment scare you away from making a lot of money. With that being said, there are plenty of crooks financing equipment, so you're best off working with someone who will tell you the truth about rates... I mean, if they are lying about rates...who knows what else they are going to hide from you? If you need financing for medical equipment, we'd love to help. Just give us a call at (866) 631-9996 or click in the picture below.